AFFTON, Mo. – Police responded to another gun store break-in, this time at Affton’s Triple Threat Armory Tuesday morning. 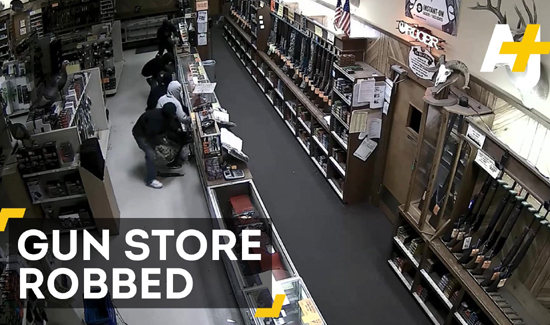 However, the store not only captured clear video but employees locked up all the guns before closing. Stephan said the thieves only got away with a couple magazines. They also stole gun boxes, but they were all empty. The crooks also left behind plenty of clues. “We got two of them with facial recognition and one of them didn’t have gloves on, so we’ve got fingerprints taken,” she said. Freeze frames from surveillance video show a guy in the hoodie peaking at the camera out of the corner of his eye. You can get a good look at part of another man’s in another shot. St. Louis County police have been here before, returning today to gather evidence and dust for fingerprints. “This is the third time in less than a year that we’ve been broken into,” Stephan said. Triple Threat is among at least six stores recently hit, including Razorback Armory in Des Peres, On-Target in Valley Park, Modern Weapon Systems in High Ridge, and Southern Armory in Crestwood.